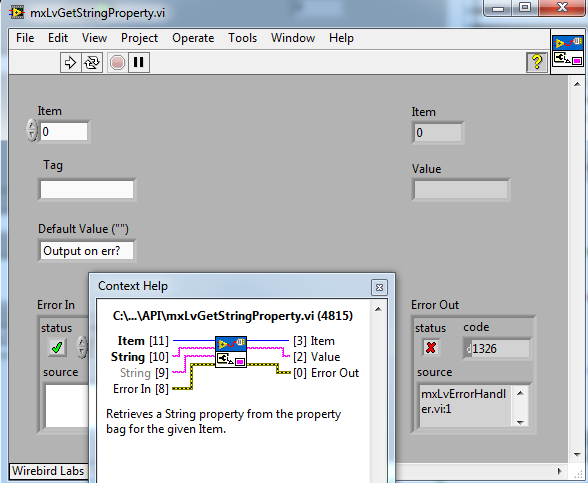 The "Default Value" terminal for the Get Properties is not returned in "Value" if the function errors; e.g., if the function is run with an invalid Item Ref. Again, fixing this functionality could break existing applications, but would provide a more intuitive experience with the Default Value terminal in the future. Sorry for the late response. The notification email somehow got lost in my inbox. Thanks for the feedback! These consistency/documentation points are actually something that's irked me for a while. I've started keeping a list of all these little things and plan on sending it to R&D once it's finalized. I'll update the forum with the CAR once it's done. Just a quick update, I filed a CAR that covers these items with CAR ID 372922.